THE LORD, ADONAI, EL ELOHÍM, YESHUA HAMASIACH, JESUS CHRIST, THE SON OF GOD, WENT OUT TO WAR! VERILY, HE CAME WITH GREAT POWER, IN ORDER TO OVERCOME THE BEAST, THE DRAGON, THAT HAD THE EARTH AND MANY PLANETS IN HIS POWER! Hello, very welcome! On July 10th, 2014, Prophet Benjamin Cousijnsen received the following message from a messenger angel of God, which I’d like to share with you. Ruacha, Yeshu, Shalom! I greet you in the wonderful name of Yeshua HaMashiach, Jesus Christ. Verily, my name is Casana and I am a messenger angel of God. 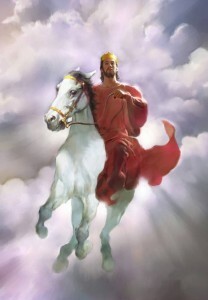 Verily, they lifted up the eyes and saw a Rider on a dazzling white horse, who went out to war. Thunder claps and lightning bolts were with Adonai, El Elohím, Yeshua HaMashiach, Jesus Christ, the Son of God! Verily, with great power and authority, He came to overcome the beast, the dragon, that had the earth and many planets in his power. And all higher powers and rulers of darkness, and stings of the scorpions, and their tails, didn’t do anything to Yeshua HaMashiach, Jesus Christ! Even though many had the likeness of locusts! He, this white Rider, had hair whiter than wool and snow. Because of the lightning bolts, flashes and power, His eyes were a flame of fire. Verily, His mouth spoke, and out of the mouth came a judgment, and by His words like a sword, they fell down and lost their power! Yeshua HaMashiach, Jesus Christ, said: Kadosh, kadosh, kadosh, holy, holy, holy am I, Yeshua HaMashiach, Jesus Christ! For not any word that comes from God, will certainly not be powerless. I and the Father are one! I am kadosh, holy. Verily, every evil spirit is subjected to Me! Luke 10, verse 19 and 20 Behold, I give you authority to tread on serpents and scorpions, and over all the power of the enemy. Nothing will in any way hurt you.Nevertheless, don’t rejoice in this, that the spirits are subject to you, but rejoice that your names are written in heaven. Verily, Yeshua HaMashiach, Jesus Christ, says to you: I have given My life and fought for you. Come rider, let us deal with the evil! And I have bought and paid for you with My precious Blood. Verily, I’m going now, spoke the messenger angel of God, Ruacha, Yeshu, Shalom!